What this chart mainly demonstrates is what an enormous outlier 1896 was. 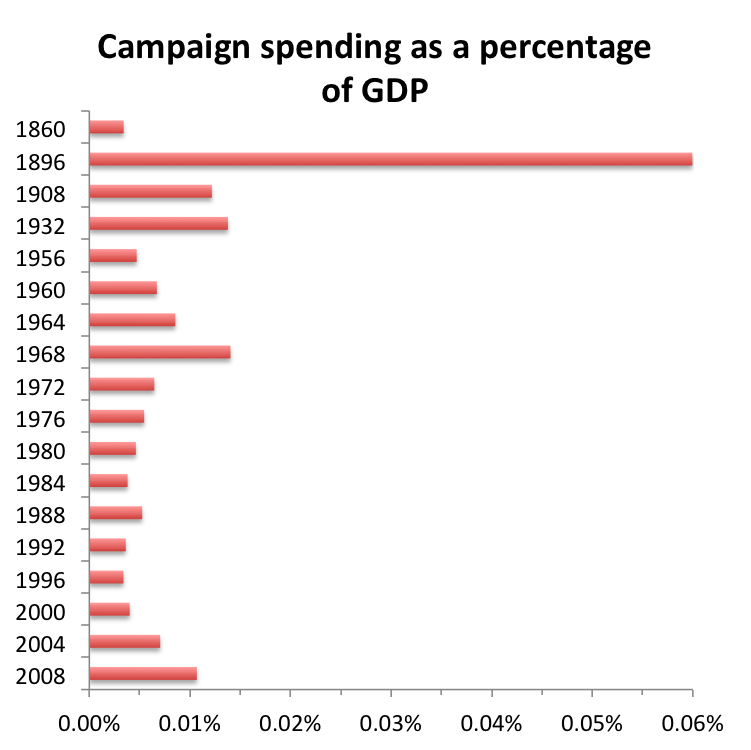 0.06% of GDP went toward campaign spending. Another way to say that is that for every $1,000 spent in the U.S. in 1896, 60 cents went to finance a presidential campaign. And as we can see, that figure dwarfed those of other years. My understanding is that spending in 1896 was largely driven by the Republican side, which outspent Democrats roughly 5 to 1. And that spending mainly came from large corporations enlisted by Marcus Hanna to beat back the silver-coining advocates they (correctly) perceived as a threat to their interests. Another observation: 2008 looks pretty unremarkable. 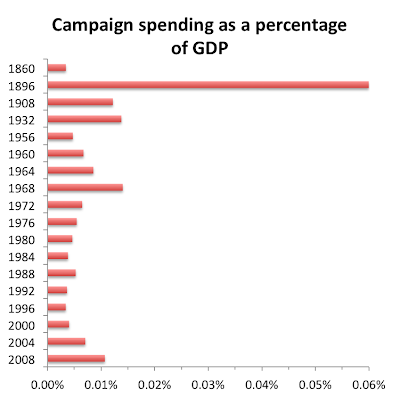 The crazy thing is that even if the Dems only spent 1/6 of the money in 1896, that's still much more than most of the entire campaign in other years. I mean, the Dems in 1896 spent the equivalent of more than double the entire cost of the 1992 campaign...and got outspent 5 to 1! So where will this year land if we count the SuperPACS? What do you think about the idea of using a 3-seat LR Hare PR election rule for state representative elections, using the same districts drawn up for state senate elections, as a way to handicap 2-party rivalry, draw more attn to these elections, give third parties a chance to win some states and to draw attn to the issues of economic/ethnic/ideological minorities in the US? That's what I blog about at "A New Kind of Third Party".